Topical vegetarian cookbook which excludes hidden fats and sugars in everyday foods. Over 150 new recipes for Rose Elliot fans. Diets low in fat and low in sugar are essential for well-being. 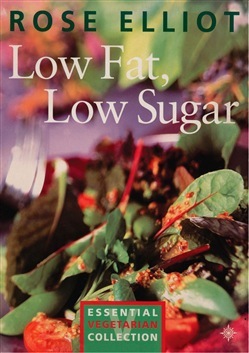 This new cookbook drives home the message that keeping to a diet both low in fat and sugar can prevent health problems. Rose Elliot tempts the tastebuds with a wide range of vegetarian meals which will appeal to health conscious people, with a special focus for those who:• want to lose weight• those suffering from diabetes and blood sugar problems• suffer from candida (she has also excluded certain fruits and yeast which allow candida to proliferate)• worry about their heart health This book will also enter the healthy foods debate with a topical look at food labelling – many products that are marked ‘low fat’ often mean ‘high in sugar’ – as well as a look at the hidden sugars in processed foods. Acquista Low Fat, Low Sugar: Essential vegetarian collection in Epub: dopo aver letto l’ebook Low Fat, Low Sugar: Essential vegetarian collection di Rose Elliot ti invitiamo a lasciarci una Recensione qui sotto: sarà utile agli utenti che non abbiano ancora letto questo libro e che vogliano avere delle opinioni altrui. L’opinione su di un libro è molto soggettiva e per questo leggere eventuali recensioni negative non ci dovrà frenare dall’acquisto, anzi dovrà spingerci ad acquistare il libro in fretta per poter dire la nostra ed eventualmente smentire quanto commentato da altri, contribuendo ad arricchire più possibile i commenti e dare sempre più spunti di confronto al pubblico online.